SREDKey? 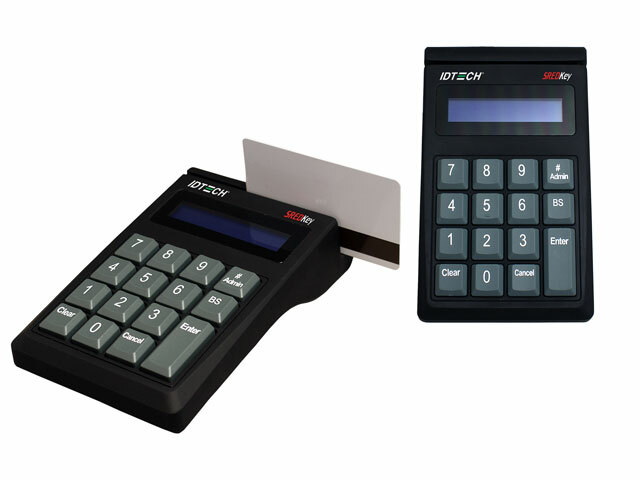 is an encrypted key pad with an LCD and an encrypted MagStripe reader that offers retailers a complete and reliable security solution that meets the PCI-PTS certification. This intelligent reader delivers superior reading performance while encrypting sensitive MagStripe and keyed-in data that reduces the scope of PCI-DSS. The SREDKey ensures all data transactions are protected through secure point to point encryption reducing fraud and data compromises. Data encryption prevents card holder information from being accessed when data is stored or in transit. It also allows customers the flexibility to choose a decryption party right for them. The SREDKey supports TDES and AES data encryption using DUKPT key management. ID TECH?s SREDKey ensures secure reading and exchange of data (SRED) to protect the cardholder?s account information at the point of acceptance. The SREDKey meets PCI certifications with its encrypted MSR and secure data entry process for protection of non-PIN cardholder data. Each SREDKey is assigned a unique serial number for tracking purposes. Encrypted data output with confirmation data in clear text form is programmable up to the first six digits and the last four digits of the account number. For increased data protection, SREDKey has several operational security levels allowing the user to select the security profile needed for the application. The SREDKey is available in both USB-Keyboard and USB-HID interfaces for flexible installation options. The SREDKey also features proven reliability known within ID TECH?s products and has an operating life of at least 1,000,000 swipes and key entries.